BUSAN -- Two young souls with traumatic pasts fall in love. While the man is a former prisoner, the woman is losing her eyesight. As conventional as it may sound, this year’s BIFF opener on Thursday turned out to be a beautiful cliche paired with its warm and color-conscious mise-en-scene. Directed by Song Il-gon, “Always” was the first film ever to be screened in the Busan Cinema Center, the official venue for BIFF, kicking off the 16th edition of the country’s premier film fest. This year, BIFF will feature 307 films from 70 countries. 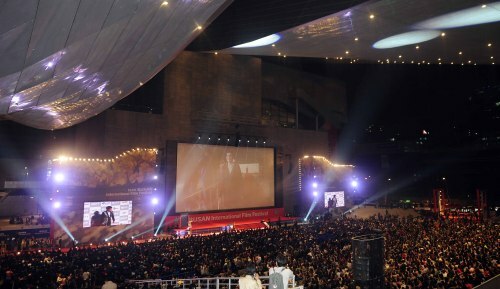 Previously known as Pusan International Film Festival, Korea’s first and largest international film bash’s opening ceremony was held at the outdoor property of its newly opened venue. A 167.8 billion won ($156 million) project, the Busan Cinema Center houses four movie venues, cafes and restaurants. Its outdoor screening space can house up to 4,000 viewers. As this year’s program includes 135 world premiers, the opening event welcomed highly acclaimed movie figures from both home and abroad. Local guests included renowned director Im Kwon-taek, veteran actor Shin Young-kyun, and actor Ahn Sung-ki. Korea’s highly popular film stars Go Soo, Kim Ha-neul, So Ji-sub, Han Hyo-joo and Kang Hye-jeong also attended the event. Renowned Hong Kong director Tsui Hark, who is best known for “A Chinese Ghost Story” (1987) and “Once Upon A Time in China” (1991), received the Asian Filmmaker of the Year prize during the ceremony. Tsui‘s first 3-D production, “The Swords of Dragon Gate,” the sequel to Raymond Lee’s 1992 film “Dragon Inn,” will premier in December. Co-starring actor So Ji-sub and actress Han Hyo-joo, “Always” tells a love story between a former boxer and a car accident victim who works as a telephone operator. It presents two reckless souls who would risk everything -- literally everything -- for love. And because they’ve got not much to lose to begin with, the characters are surprisingly convincing in spite of the film’s awfully simple and predictable plot. Song, who won the New Currents prize at BIFF back in 2001 with his film “Flower Island,” has made a comeback with this conventional melodrama, which manages to be a solid tear-jerker deftly woven with epic action and various social issues from the underbelly of urban life. This year’s BIFF closes with Japanese director Masato Harada’s 2011 work, “Chronicle of My Mother.” It tells a story of a successful author whose mother suffers from Alzheimer’s disease, and the secrets of her life that ironically unveil as she begins to lose her own memories. The festival’s Gala Presentation will feature seven new films by renowned directors in Asia. They include director Bong Joon-ho’s “The Host 3D” -- the 3-D version of Bong’s famous 2006 movie of the same title -- and “A Reason to Live” by director Lee Jeong-hyang, which stars big-name actress Song Hye-gyo as a young female producer whose fiancee has been murdered by a teenager. The festival runs until Sept. 14 at five venues in Haeundae including the Busan Cinema Center.